Normally displays the timer as HOURS : MINUTES : SECONDS with the blinking colon during counting. The 6-digits timer display may be also switched to show MINUTES : SECONDS : 1/100Sec . The 6- digit clocks may be also switched to operate as the 4-digit clock or timer in the 4 OLDER digits . The 6 Digit displays come with either SAME SIZE or SMALLER SECONDS. Either UPPER or LOWER Smaller Seconds may be ordered. The Timer - Counter modes of operation are selected via the Remote Control. and the user can switch modes to display the timers/counters in the digital clock display area instead. 1/100 Seconds Timer - Stopwatch is available for the 4 and 6 Digit displays,. This timer resolution may be selected via the remote control. The wake-up time is preset via the Remote Control. When the alarm time comes, the internal buzzer will be activated, if enabled, and will sound in a "soft" manner changing the frequncy of the "beeps" so that it does not sound annoying to the person who is just about to wake-up. The alarm can be silenced on command from the remote or it will expire by itself after several minutes. The alarm can be restarted for the next day with a push of a button on the remote. A light on the display indicates if the alarm is set. This feature is included in all SELENA clocks. The programmable timer/counter start value is preset via the Remote Control. This value is stored in the internal memory. At any time, the user may stop the timer and reset it to the preset value or change the preset value via the remote control. The preset will be recalled automaticaly by the next start. NOTE: Normally, the timer/counter is operated via the remote control that has a limited range of appx. 30 feet ( 10 meters ). When external switches or pushbuttons are needed to operate the Start/Stop/Reset functions, order the option # 738 that allows for wiring of the external swicthes up to several hundred feet ( meters ) away from the clock/timer . ( click HERE for image ). Click HERE for wirig examples . A) Count down from the preset value to zero. B) Count up from zero until stopped. C) Count up from zero to a preset value. D) Count up or down with Enable/Disable and Reset ( machine timer ). E) Count up or down CYCLING through the upper, programmable limit or through zero and automatically reloading and restarting. G) Count up with 1/100 second resolution ( may be used via the remote control but best used with option # 738 installed ). NOTE: All above functions can control the internal buzzer and/or internal relay during the count down or at expiration ( selectable ). 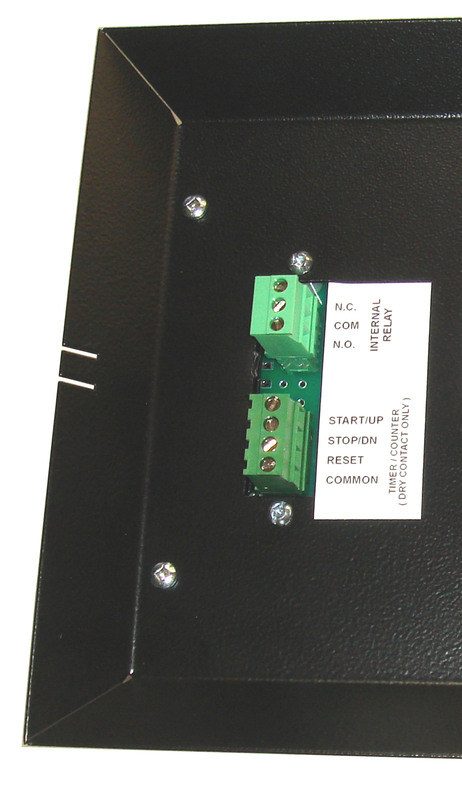 Option # 727 : Count up or down with activation of internal SPDT relay contacts ( 10Amp / 250V max. ) for switching of external load, buzzer or siren. Option # 708 :Count up or down continued during the power interruption with or without accumulating the lost time. 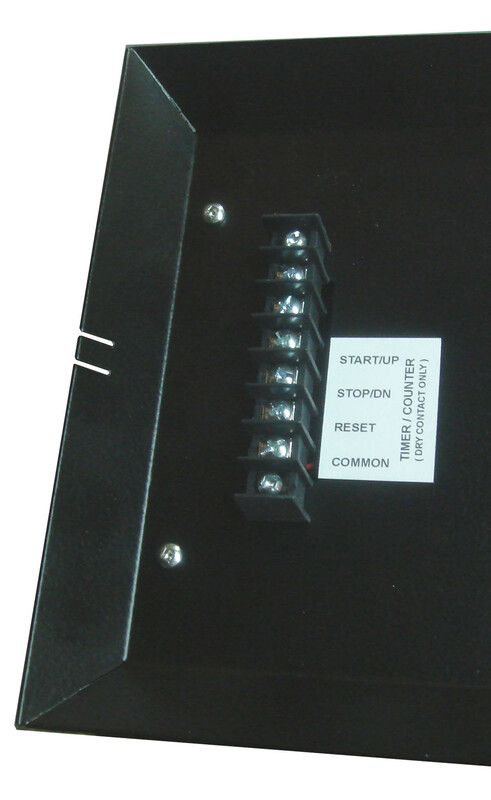 Option # 738 External Start / Stop / Reset input terminals for timers or UP / DOWN / RESET inputs for event counters. SELENA clocks can be used as a Stopwatch, Programmable Up Down Timer or Programmable Up Down Counter. If the Hrs:Min mode is enabled, the timer will display Hrs:Min as long as the time is over 1 hour. However, when the timer falls under 1 hour ( in both, count-up and count-down modes ), the display will switch automatically to show Min:Sec. NOTE: In the MASTER - SLAVE clock system, the slaves can display the Master Timer or have their own timers. If in different screen, the timer will come on the display automatically when a timer key on the remote or an external input is activated. on the clock back panel. Any type of "dry-contact" switches can be connected to the external inputs. In some, special cases an NPN Open Collector may also be used. All timer or counter function modes and all ACCUMULATING and SPORTS operating modes may be used.. The count-down ( or count-up ) may be HALTed for an indefinite period of time and then RESTARTed to continue counting. The count-down ( or count-up ) must be STOPped and then RESET before it can be RESTARTed. The relay contacts ( 10Amp / 250V max. ) are accessible at the back panel terminal block. TIMER / COUNTER remote Push-Button Plates.